Don’t believe the hyperbolic quote from Gizmodo’s Germain Lussier on the TV spot for Disney’s new animated feature “Zootopia” that proclaims it as “…the best film Disney Animation has made in 20 years!” Whoa. Yes, it is a highly-entertaining and enjoyable movie with a clever script and great characters, but come now, the folks behind “Zootopia” were also responsible for “Bolt”, “Tangled”, “Wreck-It Ralph” and the Oscar-winning “Big Hero Six” (not to mention a little movie called “Frozen”). Those are memorable features that are rewarding with each repeated viewing and audiences will like “Zootopia” just as much. I can attest that myself and the fellow viewers at the screening I attended (which included press and everyone else – so, lots of kids were giggling), erupted in laughter and there may have been a few knee-slaps as well (guilty). So, if you’ve grown weary of anthropomorphic animated movies – hold on, this is how it’s done right. Disney’s 55th animated feature is set in a world similar to ours in many ways, except that there’s absolutely no humans – just walking/talking animals with the same human characteristics that viewers can relate to. The story opens by creatively killing two birds with one stone (figuratively, of course), by offering both a backstory for our protagonist and bit of exposition (more like world-building, actually) for the world we’re being introduced to. In it, we find Judy Hopps (Della Saba) an optimistic young rabbit from the farm community of Bunny Burrow, acting out a play with her peers for their parents that touches on themes such as ‘following your dreams’ and ‘being anything you want to be’ and how animals have evolved from “predator or prey” and can even grow up to be a cop, which is what Judy is hoping to one day become. Her idealistic goals are shot down by her parents, Stu (Don Lake) and Bonnie (Bonnie Hunt) shoot down her dreams by reminded her that they found success in being complacent and giving up on their dreams by defaulting into carrot farmers and even try to encourage her to pursue a similar path. But, Judy is made of sterner stuff and even when she is pushed down on the ground (literally) seconds later, by a red fox bully, her stubbornness kicks in as she reaffirms herself that she will never quit what she sets out to do. Sure enough, we reunite with Judy (Ginnifer Goodwin) years later training at the police academy for Zootopia, a sprawling and bustling metropolis, far away from her country upbringing. Despite her diminutive size, she overcomes the physical challenges and difficult elements and winds up becoming the top of her class. In a major public announcement by Mayor Leodore Lionheart (J.K. Simmons) is designated as an officer of the Zootopia Police Department and assigned to the 1st precinct downtown. 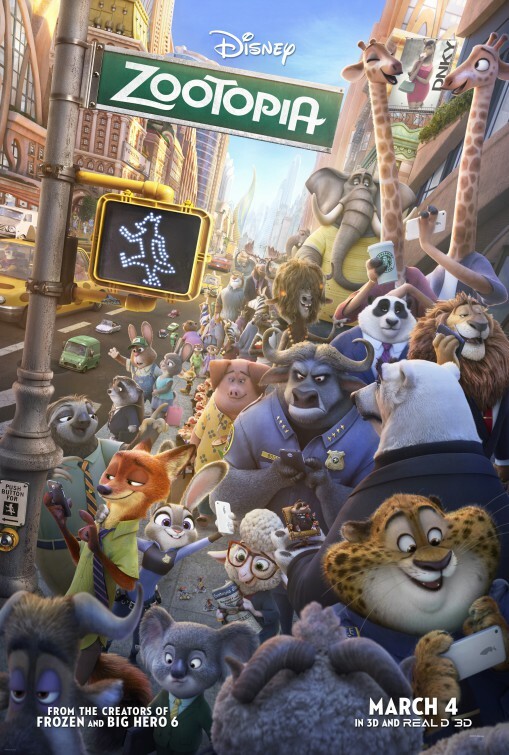 Despite her pessimistic parents, Judy excitedly heads to the big city, shown to her studio apartment and then, much to her dismay, is relegated to parking duty by Chief Bogo (Idris Elba), a frowning buffalo who could care less about her abilities, seeing her as just another equality hire from city hall. Judy’s resilience brushes off any tempted setback and she immediately becomes the best meter maid ever – 200 tickets before noon on her first day. It may not earn her a good reputation with citizens, but doggone it she’s focusing on doing the best with what she’s given. Still, she’d rather be going after the fourteen ruthless animals at large that all the other officers are assigned to track down. 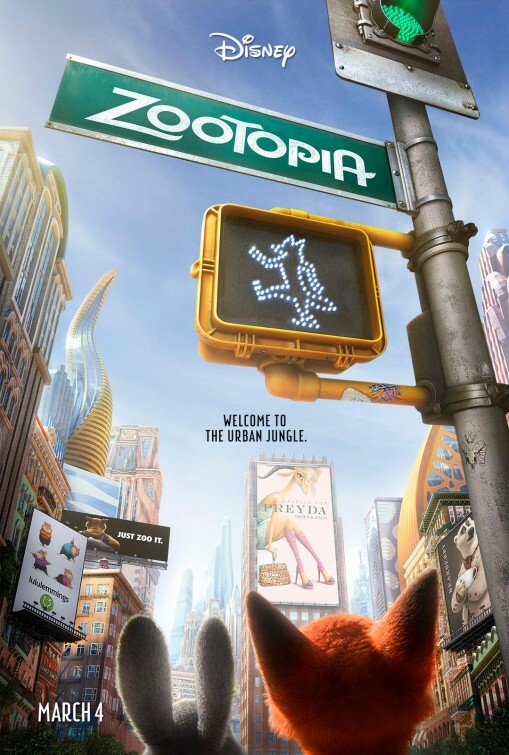 But when she is manipulated by Nick Wilde (Jason Bateman), a con artist red fox with a fennec fox accomplice named Finnick (Tom Lister, Jr.), she is embarrassed and incensed, receiving a wake-up call to the harsh reality of city life. Then, on her second day on the job, the Judy breaks protocol and apprehends small-time crook, Duke Weaselton (Alan Tudyk, who voiced the Duke of Weselton in “Frozen”, hmmm…) from stealing a bag of plant bulbs. Her zealous arrest is met with a volatile Chief, reprimanding her for stepping outside her duties, but then an opportunity steps into the Chief’s office in the form of a troubled Mrs. Otterton (Octavia Spencer), who’s looking for her missing husband. Jenny hops (had to) at the chance to take the case and is backed by the equally diminutive Assistant Mayor, Dawn Bellwether (Jenny Slate), a kind and supportive sheep. Chief Bogo agrees to give her the case on the condition that she solve the case in 48 hours or she hands in her badge. Knowing that her rookie status still gives her limited resources, she convinces street-savvy hustler Nick and to partner with her on the case or else she’ll charge him with tax evasion. Knowing he’s in a spot, Nick agrees and the two embark on a trail that runs deeper than either of them thought, revealing a twisted and shadowy conspiracy designed to turn animals against each other, giving certain species long-deemed prey an advantage over those considered predators. The screenplay of “Zootopia” is surprising. It has a lot more going for it than I thought it would and next to the movie’s vibrant, simply beautiful animation and character design, I can confidently say that the movie’s story is its greatest asset. I suppose I shouldn’t be too surprised considering the pedigree of writers, Byron Howard, Rich Moore, Jared Bush, Phil Johnson and Jennifer Lee – all of whom worked on the award-winning movies mentioned above. Their story not only covers themes like following your dreams and not letting anyone or anything hold you back from becoming who you want to be, but it also touches on issues like bigotry, prejudices, stereotyping and political corruption – all in a very witty and continuously engaging tone. Like the previous work these writers have delivered, there is thankfully something for any age here – which is fortunate considering the sight of talking animals usually send certain moviegoers running in the opposite direction. Another welcome surprise is how the writers planted the heart of their plot in classic whodunit conventions. The movie pays homage to many film noir and gangster tropes while remaining in the rated-PG realm. Granted, much of these observations will only be made by adults, but it’s nevertheless a funny and clever way to add a palpable atmosphere and level of mystery to the movie. Plus, we get to meet an assortment of distinctive places and characters that appropriately align with the genres the movie is acknowledging – such as Little Rodentia, a miniaturized borough in Zootopia where only mice, rats, shrews and the like reside. It’s ingenious the way directors Howard, Moore and Bush (who also voice characters) handle the differences of size in both geography and characters, often resulting in some of the biggest (and smallest) laughs. Speaking of characters, as the duo that we follow throughout the movie, Goodwin and Bateman have undeniable chemistry together as Judy and Nick. Their characters each have a succinct and poignant arc, giving the actors a chance to explore more emotions than expected. Actors like Slate and Tudyk, add great support to the main roles, adding great characters to a diverse cast of animals. Other actors that also bring some great comedy are Tommy Chong as a laid-back Yak who runs a naturalist spa, Nate Torrence who voices an obese cheetah officer who works the precinct’s front desk and Shakira, who plays a Beyonce-type pop star gazelle named Gazelle whose song, “Try Anything” (performed by Shakira) becomes an infectious ear worm. There’s also venerable voice actors that fill out the cast, such as Maurice LaMarche as Mr. Big (a nod to Don Vito Corleone and Martin Scorsese) and John William DiMaggio as an elephant who runs an ice cream parlor. All of these actors, combined with the talented designers really bring an inventive diversity to the world that’s created in “Zootopia”. The movie is a perfect example of Disney at its best, by mixing classic animation conventions of their past classics and moving forward with innovative a computer-generated style that flows with an organic life-like quality at times. 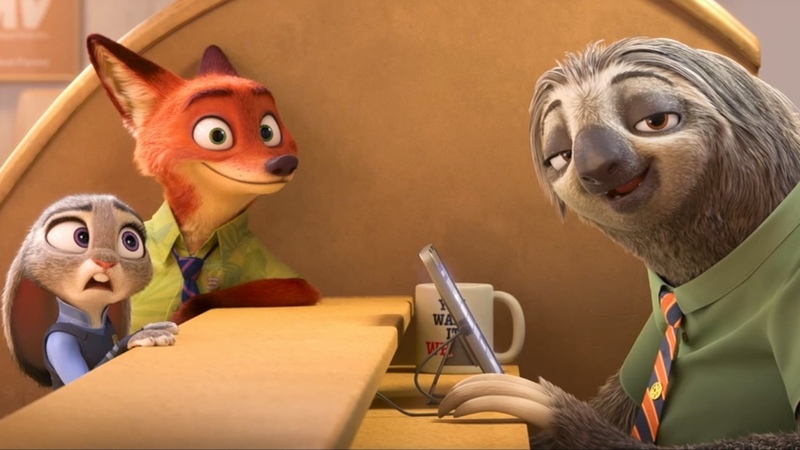 Based on the trailer – yes, that sloth DMV scene is hilarious – I had a preconceived notion of what “Zootopia” would offer, but I found myself delightfully taken aback by how wonderfully it goes about what it’s about.